The essence of a truly good lawn is surely helped with regular cutting today a straightforward practice with our modern mechanical aids. Parks and lawns have always been a backcloth to any English landscaping feature, particularly on large country estates. Towards the end of the 18th century the upkeep of such grounds was a highly intensive practice. At Blenheim over 200 labourers were used on the estates, with 50 being used on the pleasure gardens and fine lawns. The lawns were cut every ten days in the height of the season, practice which would have been started early in the morning when the dew was on the grass. The scythesmen, or mowers as they were known, worked in lines. The scythes they used had very long blades and these were kept constantly sharp by use of a stone. In fact the blade tended to have a serrated edge like a saw and the action against the grass was a sawing motion, leaving sear marks on the lawns. Later in the day the women and children employed on the estate would collect the mowings. To keep the larger areas of parkland well cropped the grazing of fallow deer and sheep was employed. 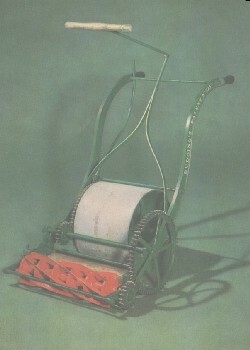 In 1830 the first lawn mower was designed and patented by Edwin Beard Budding of Stroud, Gloucestershire. Until recently not much was known about Edwin Budding. He was born in the last quarter of 1795, the illegitimate son of a yeoman farmer, though having a good education. He started work as a carpenter but soon drifted into the iron foundries where there was a need for pattern makers. It was quickly found that Edwin Budding had a knack of solving engineering problems and he is known to have worked for more than one iron master. Between 1825 and 1830 he designed a Pepper Box pistol which was further advanced than Samuel Colt's patent of 1836. In 1840, along with the Earl of Ducie and Richard Clyburn (the latter was the inventor of the threshing drum), he designed a machine for cutting vegetable substances. In 1843, along with George Lister of Dursley, he improved the carding machine the same machine from which he obtained his own idea to design the lawn mower. The improvements to the carding machine have never been altered, even in today's machines. Budding also designed a shifting spanner and a lathe. In 1830, on designing the lawn mower, he went into partnership with John Ferrabee, owner of the Phoenix Iron Works and known for producing high quality engineering goods. The partnership concluded that Edwin Budding would solve any problems in the production while John Ferrabee took care of sales and legality of the patent licence. The first machine produced was 19in in width with a frame made of wrought iron. The mower was pushed from behind with the motive power coming from the rear land roller which drove gears to transfer the drive to the knives on the cutting cylinder; the ratio was 16:1. There was another roller placed in between the cutting cylinder and the land roller which was adjustable to alter the height of cut. On cutting, the grass clippings were hurled forward into a tray like box. It was soon realised, however, that an extra handle was needed in front of the machine which could be used to help pull it along. Two of the earliest Budding machines sold went to Regent's Park Zoological Gardens in London and the Oxford Colleges. John Ferrabee soon realised that, although his own selling network was well established, he needed a larger field. In 1832 Ransomes of Ipswich gained a licence to produce and wholesale the Budding mower. This was an ideal situation as now the mowers were being sold within a well established network, Ransomes being the principal producers of agricultural plough shares. During the 1830s Ferrabee extended the range with 16in and 22in machines and by 1840 over 1,000 Budding mowers had been sold. Initially Ransomes were acting as wholesalers from their showroom in Bury St Edmunds but in 1837 they started to produce the machines under licence. An extract from George Biddell's memoirs states: "It was during April in the year 1840 when I came to the foundry on probation. The principal work being done by the firm was fitting up Budding lawn mowers" (George Biddell later be came the first lawn mower manager for Ransomes). Unfortunately Edwin Beard Budding died of a stroke in 1846 at the age of 50 and, like so many inventors, did not see the full results of his design. W F Carnegie of Arbroath, Scotland, was another purchaser of a Budding lawn mower. Carnegie's problem was that his lawns covered 2½ acres and the Budding machine was not up to the job. He engaged a local engineer, James Shanks, to set about making a machine of 27in width which could be pulled by two men or a pony. The latter was found to be best and when cutting was carried out in dry weather the pony left no traces on the grass. In 1842 James Shanks patented his design in Scotland. Up to 1852 Scotland had its own patent system so Budding's patent only covered England and Wales. Nonetheless, Ferrabee travelled to Scotland in 1841 to check with Shanks to make sure there were no infringements. Shanks started lawn mower production in 1842 but the machines were designed by Mr Talbot, an employee of Shanks. His machine was of 48in width. Shanks mowers soon became well known. In 1846 a machine was sold to Clumber Park in Nottinghamshire and an article written at the time stated: "The machine has been in constant use in the gardens at Clumber for upwards of three months. It is constructed on the same principle of Budding's patent mowing machine but altogether stronger and, of course less liable to go out of repair, the cutters are forty-two inches in length, it is drawn by one horse requiring a boy to lead the horse and a man to direct the machine. The saving in labour has amounted to seventy per cent."